Awwww, ma, raw veggies AGAIN! Yes, I know it is difficult but there is nothing healthier. I don’t know about you, but I find raw veggies to be a wee bit dull. I do eat them and I find the CRUNCH satisfying. The problem is that my favorite dips are made with sour cream and onion soup mix. While totally delicious when consuming this classic combo - this is not the healthiest choice. I was looking for a new creamy, salty, healthier choice when I came across a feta dip. This way you are getting the salty from feta cheese (instead of MSG in onion soup mix) and you get some protein as well. Most of my recipes only have one step, but this one is a bit more complicated. I use roasted garlic in the dip because roasting mellows the sharpness of garlic, which so many people find a turn-off. Roasted garlic lacks the bite of fresh garlic and (bonus) it is easier to peel. You just squish the garlic out of it’s peel and voila - garlic! Roast the garlic when you are baking something else so you don’t use a huge oven for a little garlic bulb. This is a great dip to include in your lunch box with your veggies. You can store it in little plastic containers and just shove them in your lunch as you rush out the door. My son LOVES this dip, and my daughter keeps asking for ranch. I can’t get them to agree on anything when it comes to food. Have you tried to roast garlic? Preheat oven to 400 F. Slice the top off the garlic bulb and pour in olive oil. Close up bulb in aluminum foil and bake for 40 minutes or until soft. When garlic is cool enough to handle, squeeze each clove out of its peel into a medium bowl. Mash garlic with a fork into a paste. Crumble in feta, add yogurt and lemon juice and stir. Mix until desired creamy consistency (not unlike cottage cheese) and serve! Your dip sounds amazing!!! I know about eating veggies, so boring without dip!! Think I'll try yours out this weekend!! Do you have any recommendations of what to dip into guacamole? Love your site and reading comments. Sounds like a must try for BBQ's going on this Labor day weekend. Thank you Snack Girl! by yogurt, I am assuming you mean non fat, plain type yes? I love your site, such great ideas! 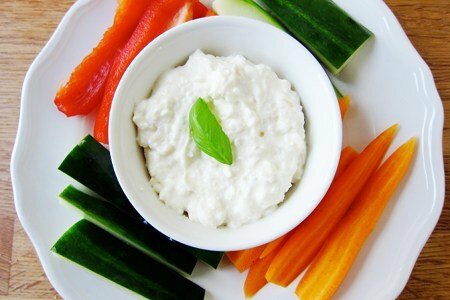 I have one for you, if you like dips... Middle Eastern 'labne' is made from straining yogurt overnight. It is thick like sour cream. I like to mix it with finely mashed garlic and salt, adding any other spices or herbs that go with whatever else I am eating. (I LOVE this with beans, but it is often spread on bread instead of mayo, etc.). And sprinkled with za'tar herbs it is absolutely delish! @Donna - any PLAIN yogurt you have around will work. I am going to fix the recipe. I ran the numbers with lowfat yogurt - it isn't going to make much difference to the overall calorie count here. Thanks for your question! I always love hummus and raw veggies for a low calorie, low fat dip! Although a dip is a nice accompaniment to veggies, I don't find veggies boring at all. Food for thought...when we get away from eating unhealthy foods, our taste buds come alive and really appreciate the flavors of healthy foods. In fact. I think I'll head to the kitchen right now for a carrot! I've never cared for creamy dips like this or ranch. If I absolutely must have something to dip, then I turn to salsa to go with my veggies. Otherwise, I just prefer them on their own. Bell peppers and carrots have great favors on their own. Speaking of flavor, try adding a little bit of salt to your cucumbers and celery. It makes a huge difference and brings out a ton of flavor! Feta is just not for me. I prefer high quality non-fat Greek yogurt (Fage) mixed with garlic and finely diced cucumber. Yum! Lower points, too. Just 1 WW Plus Point in 1/3 cup!